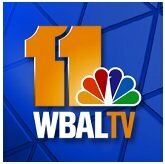 News TV Channel / WBAL-TV, virtual and VHF digital channel 11, is an NBC-affiliated television station licensed to Baltimore, Maryland, United States. WBAL-TV is one of three flagship television stations of the Hearst Television subsidiary of the Hearst Corporation, and is co-owned with radio stations WBAL (1090 AM) and WIYY (97.9 FM). The three stations share a studio and office facility on Television Hill in the Woodberry section of Baltimore, near the transmitting tower that WBAL-TV shares with WIYY and four other Baltimore television stations.